Layers of strawberries in a strawberry flavoured jelly, sponge, custard and stabilised cream. British Cream Made with real strawberries for a sweet and juicy flavour. Our chefs work together to create family favourite recipes using traditional layering as you would at home. 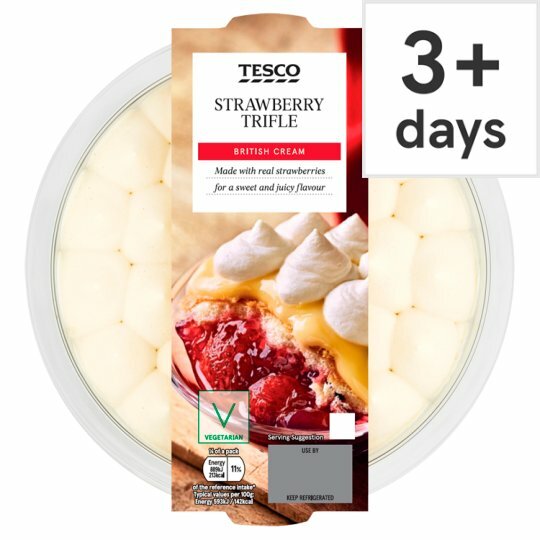 INGREDIENTS: Custard (24%) [Whole Milk, Skimmed Milk, Sugar, Modified Maize Starch, Water, Stabiliser (Pectin), Flavourings, Colour (Carotenes)], Water, Cream (Milk) (22%), Strawberry (14%), Sugar, Dextrose, Wheat Flour (Wheat Flour, Calcium Carbonate, Iron, Niacin, Thiamin), Pasteurised Egg, Stabilisers (Pectin, Locust Bean Gum, Calcium Phosphate), Strawberry Concentrate, Dried Skimmed Milk, Milk Proteins, Acidity Regulators (Citric Acid, Trisodium Citrate, Calcium Lactate), Raising Agents (Disodium Diphosphate, Potassium Bicarbonate), Flavouring, Colour (Anthocyanins), Emulsifiers (Polyglycerol Esters of Fatty Acids, Mono- and Di-Glycerides of Fatty Acids).